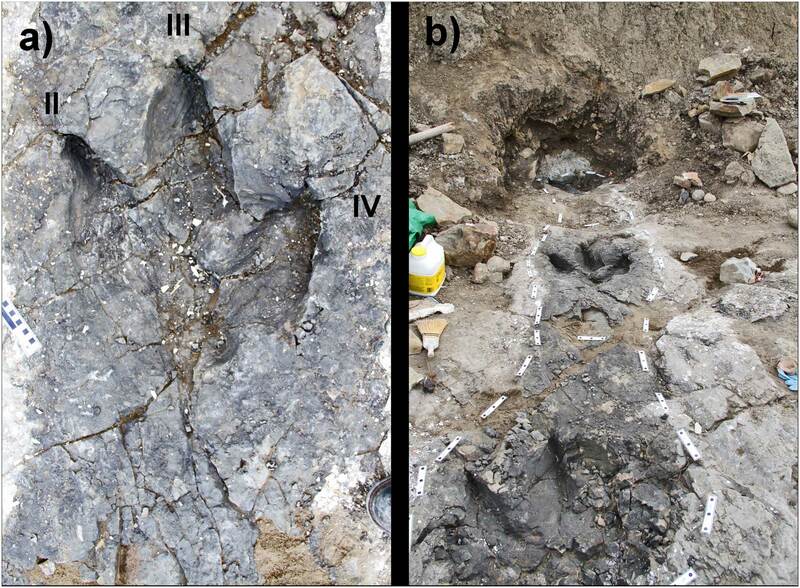 A REVIEW OF VERTEBRATE TRACK-BEARING FORMATIONS FROM THE MESOZOIC AND EARLIEST CENOZOIC OF WESTERN CANADA WITH A DESCRIPTION OF A NEW THEROPOD ICHNOSPECIES AND REASSIGNMENT OF AN AVIAN ICHNOGENUS. The lead authors are not unknown to anyone familiar with the Peace Region Palaeontology Research Centre in Tumbler Ridge: Richard T. McCrea and Lisa G. Buckley. Together, over a period of ten years, they have taken this institution, specializing in vertebrate tracks and trackways, from fledgling status to being the most active and respected facility of its kind in Canada. 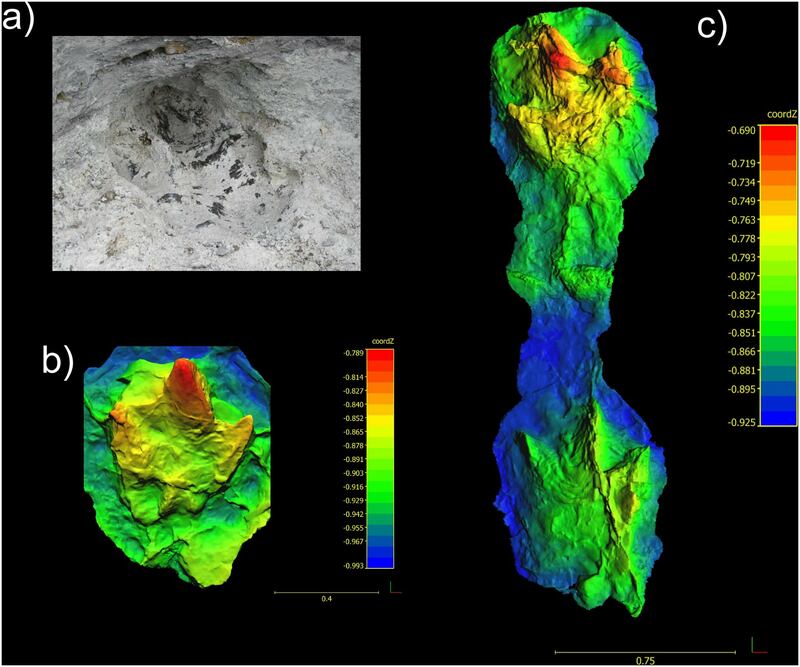 And now, along with other famous palaeontologists and geologists, including internationally renowned Philip J. Currie, they have produced a landmark research paper that immediately becomes the gold standard of dinosaur trackway knowledge in western Canada. The journal in which this research paper recently appeared, Bulletin 62 of the New Mexico Museum of Natural History and Science, is unlikely to be on everybody’s reading list, as this is not necessarily relaxing reading matter for the average Canadian. Presented in specialized scientific language, it describes in great detail all of the track-bearing layers spanning over a hundred million years of pre-history. Its ninety page length is liberally illustrated with a variety of photographs, mostly of dinosaur tracks and trackways… again, not everyone’s idea of a good bedtime read. However, for the scientific and palaeontological communities, its importance is immense, and for those interested in this field, this culmination of almost two decades of research provides a captivating read. And for the Tumbler Ridge Aspiring Geopark Society, busy with its application to become a member of the Global Geoparks Network, the publication of this scientific paper could not have come at a more opportune time. Being able to cite and provide research of this standard greatly strengthens the quality of the Society’s bid, and copies will be presented to the dignitaries from the Global Geoparks Network, authorized by UNESCO, as they conduct their evaluation mission in Tumbler Ridge in June. If designation as a Global Geopark is granted in September, that would be huge for Tumbler Ridge diversification and tourism, and especially beneficial for the community in this time of economic hardship (elsewhere in the world, Geopark status has led to numerous economic benefits). Research of an impeccable standard underlies the project and enables the kind of displays that can be viewed in the Dinosaur Discovery Gallery, as well as tours and educational activities. This research has yielded the information needed to tell the fascinating story of past life in this amazing corner of our planet to the world. Specimens are discovered, collected, prepared, described, displayed… as a result visitors to Tumbler Ridge, seeking knowledge and an enlightening experience, can enjoy our community and leave fulfilled. Without this research there would be no potential Geopark. Next, volunteers are inspired, and take the lead in driving the project forward, a grassroots, bottom-up approach that typifies successful Geoparks. Politicians at various levels get on board and lend support both verbal and financial. All in all it makes for a very powerful message, complemented by our magnificent scenery and 70 kms of volunteer-maintained hiking trails to 42 potential Geosites. Now we have to cross fingers and hope that our aspirations and vision will be realized for what our community can become. If we do succeed, there will be many people to thank and pat on the back. And one couple will be certain to be included – these two scientists who have worked so assiduously to lay the groundwork, for the benefit of Tumbler Ridge and the Peace Region. A limited number of hard copies of this scientific paper have been produced – one for each of the dignitaries, one for Mayor and Council, one for the Regional District, one for MLA Mike Bernier and his provincial colleagues, one for MP Bob Zimmer. It will be available for perusal at the Dinosaur Discovery Gallery, and extra copies can be printed if requested.